On Sunday I posted some pictures of this castle that sits above Sax, Spain. The view at night is impressive. As Earl and I prepared to go into town for dinner at 9 pm, we stopped to take this shot of the Moorish fortress in town. This is the view from the house where we’re staying. It’s hard to get a good shot of lights on an iPhone at night. Here’s a closer look that turned out well as we were driving home from dinner at 11 pm. See this could work as a diet plan. By 9 pm (they don’t start serving dinner until 9:30 usually) I’m tired enough that I might just curl up with a book and skip dinner. But the castle is beautiful at night. Last night, we just made omelettes around 7, but I taught 9 classes and was wiped out. Still, the full moon peeked through the window at me. On Friday, we drove from our house in Quillan, France to a housesit near Sax, Spain. It's about seven and a half hours of driving time. Earl has never been to Spain and I've only been across the border once when we went to a shopping mall -- I know, not really Spain. I must remember to say buenos dias instead of bonjour. We took the motorway, which showed us that Spain is doing well with warehouse and factories, and a steady background of rugged mountains all along the way, with glimpses of the Mediterranean to our left. It took three hours to get to Barcelona and then another three hours to get to Valencia before we turned a bit north to reach Sax. Sax has a Moorish castle ruins which we hope to explore from the outside since it is rarely open on the inside. This is one of a series of Moorish castles, keeps, or towers that were built on mountains so they could be lit up to warn Madrid of an incoming invasion. The towers are all visible along the chain, as one lit up, the next one would light up, etc. until it reached Madrid. Amazing. The Cathars in our area of France did the same thing with a series of lookout towers that they would light for invasions. Our host Chris explained that the Spanish towns have festivals every year called Moors versus Christians and they act out the battles when the Christians took over Spain. The sun rises later here since we're farther west as the colors just begin to peak above the peeks at 8 a.m. Check back and I'll post a nighttime picture of the Sax fortress. It looks amazing like a pool of lights floating in a castle shape. The hosts of our housesit, Chris and Sarah, graciously met us with drinks and their handsome cat Bailey. After a very brief run to get myself oriented, I taught a few classes before Earl and I are off to explore the town then return for more classes. One of the benefits of living in Europe, of course, is that we can explore nearby countries. In the coming month, we will also be visiting Lake Como in Italy and then Dublin, Ireland. Might as well take advantage while we can! The boulangerie stayed open throughout the season, tourist season that is, so now they’re taking a break. A »congé » the hand-written note explained. I asked a French waiter last night and he explained that a congé is a vacation but for a business. So two weeks relying on the peripheral bakeries. The time difference between us in France and our world back home can get draining. My morning in France began about 4 a.m., that's 10 p.m. at home. I'd been sleeping for about 6 hours when I heard a groan from the kitchen where my husband was watching Ohio State University football. The game began at 8 p.m. at home, which means it started at 2 a.m. here. As much as I love OSU football, I made no pretension of staying awake for the game. But once awake, with six hours of sleep under my belt, I decided to get up and watch. Like I was punching a time clock and switching shifts with him, Earl went to bed as I settled in front of the computer screen for the game. The score was 14 -13 at the half with Ohio State down by 1. Earl had groaned when Ohio State missed a field goal before the half. I texted with Spencer who was watching the game nervously. We both agreed Ohio State would come back and we were right. I messaged with Tucker who was working as a DJ at a wedding and bemoaning the fact that he couldn't watch the game. "Call me on your way home if you get sleepy," I told him. He would be driving home from Indianapolis until nearly 3 in the morning. I knew I would be up by then to keep him company on the drive. At a quarter to 6, the game ended with Ohio State winning 40-28. What a satisfying way to greet a Sunday morning. I had an hour I could sleep before I needed to get up to prepare to teach some English classes to Chinese children, so I went to bed, the sky still dark. Within about 20 minutes, my phone rang. Tucker had taken me up on my offer of a phone call to keep him company. Really, he wanted to know about the game. So I told him all the important news. Nick Bosa out with a groin strain. The quaterback running it in for a touchdown. A trick play by TCU that ended in a touchdown but was called back. I love chatting with my kids like their down the street rather than across the ocean. Then he told me about the wedding -- an Albanian man and an Indiana girl. The Albanian people didn't dance to the U.S. music and the Indianans didn't dance to the Albanian music. But he loved seeing them lift that Indiana girl into the air on a chair and dance around to her. He's learned a lot about different cultures since he started doing weddings. Last time it was an Indian wedding. After we talked for awhile, he agreed to text me when he got home so I'd know he was safe driving through the flat farm fields of Indiana and Ohio. I taught three classes and then Earl got out of bed with very little sleep. We hopped on our bikes and rode to Esparaza, about a 30-45 minute bike rode for the Sunday morning market. We stocked up on some fruits and vegetables and then stood in line at the bakery to get a vienoiserie we could eat with our coffee in a nearby cafe. The tray that holds the chocolate croissants, known as une chocolatine in this part of France, was empty. I asked if they had more. "Oui," the woman assured me and came back with two chocolatines still warm in the paper bag. We walked to a cafe and joined friends we had run into earlier at the market. For half an hour we sipped coffee and talked about our lives, dripping flaky crumbs from our chocolate pastries. We took one more walk around the exotic market. African instruments, Indian batiks and incense. This town is very artsy and eccentric. It's a great place to visit on a Sunday morning. We stopped at a food truck and purchased a small rotisserie chicken along with a portion of small potatoes roasted underneath the poultry with the dripping chicken grease flavoring them. Double wrapped in paper then plastic bags, the chicken was strapped with a bungee cord to the back of my bike before we rode back home. The ride home felt a little longer, especially the ride up the hill to our rental house. I wiped away the sweat while Earl put lunch on the table. The moist chicken and delightfully flavored potatoes were just enough to fill me before five more classes with Chinese students. This life in France sure is full of entrancing experiences. 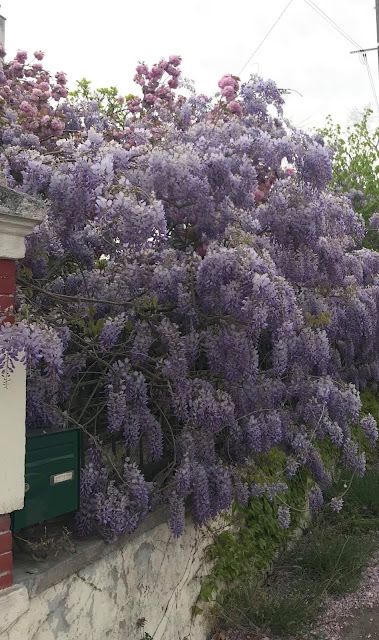 Many times I write about my unsuccessful attempts to fit into French life, but yesterday, I came home feeling quite pleased with myself after only a half an hour of several French conversations and interactions. I shouldn't only tell you the bad, so a little bragging on my part. I walked downtown late in the afternoon, and as I rounded the corner toward town, a couple standing on a corner called after me. I turned and the man asked where "une épicerie" was. I paused, wondering if he meant a spice store or small grocery, but then he corrected himself. He was searching for "une boulangerie," a bakery. No problem. I was walking right past the bakery. I invited them to follow me around the corner where the town square opened up, away from the main road that cuts through Quillan. The couple were from Belgium and I left them at the door to the bakery as I made my way to the papeterie that sells magazines, newspapers, notebooks, pens. I was in search of paper clips, but I had forgotten to look up the word. I waited for the woman behind the counter to wait on a few other people, which always takes awhile. There are many greetings, kisses, conversation about a zumba class. Finally, the woman in front of me buys two paint brushes along with an oversized pad of paper. The clerk turns to me, "Madame, bonjour!" "Bonjour,"I reply before saying in French that I don't know the word for it, but I need the thing that holds paper. I point to the shelf behind her where I see the box of paperclips. "Les trombones," she says merrily. "Bien sur," I say, of course. She starts to explain how a paper clip looks like a trombone slide and I nod, understanding. I pay and slip the box into my bag when I hear the clerk exclaim, "Oh la la!" I arch an eyebrow and she shakes her head. "It isn't you," she says. She holds up the oversized pad of paper. I ask if it belongs to the previous woman and she nods. I rush out the door and look both ways before I see the woman in front of the shop window next door. "Madame," I say, "you forgot your paper." The woman tuts and goes back into the store carrying a wicker basket on her arm. I'm sure the ensuing conversation between the clerk and her will take at least 10 minutes. That's just how it is. People pause to share their lives with each other. This old fortress, known as "the chateau" in town, was the tax collector's home. I go to the pharmacy next and hand the pharmacist my prescription. He starts to ask for my "carte vitale" which is a health card for French people then stops himself. He remembers that I don't have one. He mutters something about having to print off the papers for me. Each time he prints off a form that I can send to my insurance company to get reimbursed, but I have discovered that my insurance company doesn't reimburse, so I tell the pharmacist not to bother. "Vraiment?" he asks, his eyebrows shooting up in surprise. So, I valiantly pay the 5.59 euros without hope of reimbursement. If he only knew that I pay $20 as a co-pay in the States. As I leave the pharmacy, I remember to remove the prescription from the bag with the box of medicine. Each time I want a refill, I have to present the paper with the prescription. I have left it in the bag before and had to go to the recycling bin across the road to search for it. Prescription safely in my purse, I head for the Spar, the local grocery, perhaps even epicerie. I chat with the clerk, commenting on how calm the store is after a summer of lines of tourists. She agrees as she rings up my dishwasher detergent, toothpaste and strawberry jam. She walks out the wide doors behind me to explain to a man sitting with a bowl hoping to collect money that he isn't allowed to beg on the main street. He is very polite as I move on to the bakery. The woman behind the counter is fixing a tray with tea for a woman sitting at a table. She greets me but continues her task, preparing the tea pot, the teabag, the cup, spoon and sugar as I look in the display case. I had hoped to buy a coffee eclair, un éclair au café, but as the day draws to a close, the case is empty of my favorite pastry. Marciel, the baker, comes out of the back and spots me. He walks around the counter to give me cheek kisses, as he asks, "ça va?" which means how are you, how's it going? I tell him in French that I had hoped to buy an eclair but am too late, the case is bare. He exclaims in fast French and jokingly berates the clerk, grabbing her shoulders in a pinch as if to choke her. All she had to do was ask, he explains as he runs to the back and returns with an armful of eclairs, both coffee and chocolate. I try to say that I hadn't even asked her yet, but he is on a roll, teasing the clerk and saying things like, "Are we a restaurant or not?" He returns to his kingdom in the kitchen while I wait my turn and take home an eclair. And as I walked home, I felt like I belonged here in France. That's Jules in the middle of the street, but the real star was the sunset over our little town. I left the house this morning for the first time in four days. I came down with a sharp sore throat on Friday that evolved into a head cold with coughing, sneezing and chills. By this morning, I decided I would be finished being sick so I went for a run, just a short one. In addition to being sick, I've managed to teach 31 English classes to Chinese kids in the days I sequestered myself. On Friday, after teaching classes until 3, my throat was hurting and I really wanted a milk shake. Milk shakes are not something easily accessible in France. I had also missed lunch and we had no bread in the house. At 3 in the afternoon in a small town, the odds of finding a restaurant to make food are very slim, okay they're non-existent. The restaurants stop serving around 2 and don't begin serving again until about 7:30. I decided to travel to McDonalds in search of a late lunch and a milk shake. Normally, in the States, I would not eat at McDonalds but with my throat searing, I needed something comfortably familiar. Plus, McDonalds does serve food in the middle of the afternoon. The only problem was that the closest McDonalds is 30 minutes away. Luckily, we now have a borrowed car, so I hopped behind the wheel and drove a few towns over. I parked the car and went inside to order my meal on the computerized menu. Quelle horreur! No milk shakes in French McDonalds either. I settled for a coke and a fish sandwich. Instead of fries, I could choose little moon-shaped potatoes. I sat in the nearly desserted restaurant where a few teenage boys hung out after school and a few mothers of young children watched their kids climb on the playground. On the drive home, I stopped at the grocery, looking for popsicles, which also would soothe my throat, but found none. I settled for ice cream before heading home. On Sunday, after teaching 13 classes and eating mostly crackers, I decided that soup would really make me feel better - chicken noodle soup. Where could find chicken noodle soup in town? Since it was Sunday after 12:30, all the grocery stores were closed, not just in our town but in most of Southwestern France. I could get some from a restaurant, but most places aren't serving soup yet. They're very serious about summer menus, fall menus, winter menus. Soup is not offered on a summer menu. But I thought of the Vietnamese restaurant in our town. If they were similar to Chinese restaurants in the States, they might offer some wonton soup. I started wheedling with Earl to go get me some. At about the same time, the heavens opened with torrents of rain and rumblings of thunder. I knew I wanted soup, but I wondered if I'd be able to eat it, my head was so stopped up. I told my valiant husband to never mind the soup. Again, if we'd been home, it wouldn't have been a big deal to go to Noodles & Co to get a bowl of soup, or even the grocery store for a can of Campbells. But trying to ask for "food to go" in another language, which Earl would have to do here, is tricky. Most places don't have takeaway, or à emporter, as the French say, at least not in our part of the country. On Monday, Earl was gone all day on a hike. He left behind a croissant for me, but I only managed crackers again until the evening when I rallied to make pasta at around 5:30. Way too early for a French dinner, but I had to strike while I felt able to eat something. I started talking about moving back home, and Earl reminded me that I always feel that way when I'm sick. So this morning, after not much sleep, I ran and then we met friends for coffee. I'm back in the land of the living and the beautiful scenery reminds me of something that I can't get back home in Ohio, even when I do miss many of the conveniences. I was in Paris for a few days meeting my husband who flew to the States for a brief hiatus. I couldn't wait to see him again but his flight didn't arrive until the evening so I was in Paris alone for the day. There are some things we haven't done that I wanted to visit, but I wanted to wait for Earl so we could see them together. So I decided to visit Les Ateliers des Lumieres in Paris. You may recall that we visited a similar exhibit in Provence back in April and I wrote about it here. I loved the exhibit in Provence of the Spanish masters and 60s pop art. 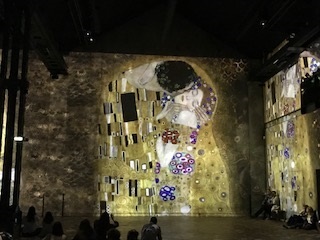 In Paris, the main exhibit is Gustave Klimt. I walked in during the middle of the show, assaulted by walls full of flowers, bathed in the colorful light. Unlike the cavern in Provence, this show is presented in a warehouse, so there are doors and scaffolding. An article I read says this is a former factory. Apparently, during the summer, the lines were out the door and around the block. Now, at the beginning of September, I waited less than five minutes before being directed to one of the ticket windows for a 14.50 euro ticket. The whole room could be transformed into a cathedral. And the floor was amazing too. Sometimes children would skip from flower to flower on the floor, or people would stand in the center of a spinning circle. It was definitely interactive art. 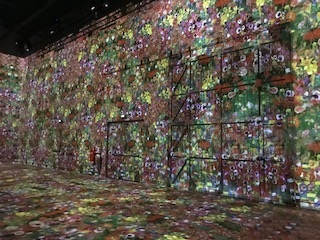 A mirrored room, with floor and walls of mirrors reflected the paintings over and over. I laid down on the floor to watch it for awhile. 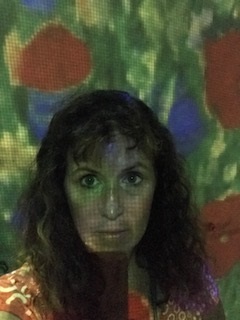 I stood against one wall and took a picture of the artwork projected on me too. Truthfully, the still pictures are amazing, but nothing can compare to the movement. The exhibition finds the action in the paintings and adds it before moving on to more details. I can't think that the artist would be upset at the changes made to his/her artwork, instead, I have to think artists would be thrilled to have so many people immersed in it. So I had to include a few minutes of video from my Youtube page. 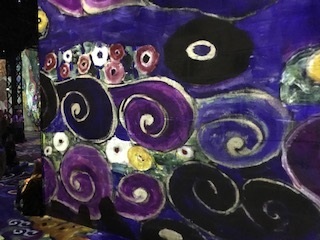 This first video shows the opening of the Klimt exhibit. This is a clip from the middle of the exhibit. The photos alone don't do it justice. There's nothing like standing in the middle of the colors and the movement.